Despite his haute-cuisine background, chef Bradford Thompson’s dream is to open a Caribbean restaurant. For research, he and his wife embark on a crisscrossing tour of her native Jamaica. It had been 20 years since I’d last been to Jamaica. As a Caribbean correspondent for the Chicago Tribune, I hung out with street gangs in Kingston, stayed up all night with Prime Minister Edward Seaga at Afro-Jamaican religious ceremonies, traveled 90 miles an hour down winding, narrow roads with Prime Minister Michael Manley as he tried to charm every last Jamaican for a political comeback. But I had never traveled through Jamaica with a chef. This was to be a particularly promising trip because the cook, Bradford Thompson, is a thinking chef who cares deeply about the cultural roots of the food he prepares. Bradford, who looks like the college football player he used to be, worked at Daniel, in Manhattan, before gaining fame as the chef at Mary Elaine’s at the Phoenician in Scottsdale, Arizona (where he was named an F&W Best New Chef 2004). But his passion for Jamaican food, which can be partially credited to his wife, a smart and beautiful Jamaican woman named Kerry-Ann Evans-Thompson, has him planning to open his own Caribbean restaurant in New York City. Bradford, Kerry-Ann and I were to take a tour around Jamaica to visit some of the best off-the-beaten-path food stops in the country. Our journey began in Hellshire, the marshlands just outside the capital of Kingston, on the southern coast. Although Hellshire was once thought of as useless swampland, its fine-sand beach has become increasingly popular with Jamaicans. It was fun to be on a Caribbean beach where no one asks to braid your hair. Bradford doesn’t have much hair anyway. Fishermen pulled their catch from a turquoise sea: gold-spotted red snappers (some really too small to be harvested without endangering the stock), angry red lobsters, yellow parrot fish with iridescent turquoise fins. Fishermen scraped off scales during a tangerine-and-violet sunset while Bradford and Kerry-Ann strolled on the beach holding hands, still looking like newlyweds after almost two years of marriage. Vernon Whyte, a small, wiry oysterman, came over with a bucket of little dark oysters from the mangrove swamps between here and Kingston harbor. Bradford, Kerry-Ann and I disposed of about a dozen each. “Not a lot of flavor,” said Bradford, somewhere around the ninth. “Subtle.” Vernon said he can easily harvest a hundred dozen a day, but he only goes oystering once a week—there is not much market for these bivalves that sell for less than $3 a dozen. 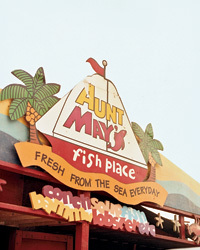 We had dinner at Aunt May’s, a dirt-floored beach shack where Kerry-Ann has eaten since she was a child. By the time she had embraced May Byrou, the motherly owner, Bradford was already in the kitchen, politely saying “Excuse me” as he poked fish and peeked into pots. May grilled parrot fish, snapper and goatfish (local red mullet) rubbed with salt and pepper while Bradford observed her every move. She also wrapped snapper in foil with herbs and “provisions” (root vegetables such as yam and sweet potato), then steamed it to make what Jamaicans call “roasted” fish. In Bradford’s version, he swaps out the yam and sweet potato for okra, tomatoes, scallions and carrots. I never enter into marital disputes, but I agreed with Kerry-Ann. May also served bammy, a kind of bread made by crushing cassava root to remove the toxic juices, shaping it into a disk and frying it. Also known as yuca and manioc, cassava is a potent political symbol throughout the Caribbean because it is one of the few pre-Columbian foods that the locals still eat. The native Arawaks and Caribs, in fact, dipped arrows in the poisonous juice and shot them at Columbus’s men. Most Caribbean food today, like most Caribbean people, has roots in either Asia or Africa. Coconuts, sugarcane, mangos and bananas, for instance, were brought to Jamaica from Asia by the British, who regarded the fertile island as a kind of botanical laboratory. From Kingston, we drove west along the southern coast, passing stands selling huge, bulbous jackfruit and hard, green June plums (both brought to Jamaica from Asia) and yellow star fruit (indigenous to Jamaica). Bright red ackee fruit hung from trees like Japanese lanterns. After about two hours, we turned off the road and drove up a small hill to the Yam Centre. The 12 small stalls all sell yams, the big tubers brought to Jamaica from Africa. Here they are roasted, split, buttered and served with saltfish—small pieces of salt cod originally imported from New England as cheap food for slaves. Usually, saltfish is soaked in water to soften and desalinate it, but here it is simply thrown on the grill. The yam stall we chose was Shine Head One Stop, next to Graney Razor One Stop. Shine Head, not surprisingly, was a man with a shaved and shiny head not unlike Bradford’s. I didn’t see what Graney Razor looked like. We continued west to the village of Middle Quarters, where locals stand by the road selling bags of shrimp caught in the Black River and cooked with peppers. These shrimp inspired Bradford’s shrimp dish, though in his recipe, he serves them with avocados in a delightful salad. We stopped by a stand that sold shrimp as well as thick, spicy crayfish soup. “Look at that,” Bradford said admiringly as he watched a customer take a whole Scotch bonnet chile pepper, quarter it and drop it into a little cup of soup—enough chile to keep a mouth stinging for days. Jamaicans often like their food like that. Five parishes west of Kingston, still on the southern coast, we entered the small town of Black River. From there, a fisherman named Austin gave us a lift on his boat to a place called the Pelican Bar, which sits on stilts in the sea a few hundred feet from land. Here we visited Delroy “Floyd” Forbes, an only slightly loony Jamaican who built the bar with his own hands. That he built it himself seems apparent from the construction: Rough-hewn branches serve as a ladder up to the crude wooden hut, which has a thatched roof and a plank floor. Unbelievably, a boatload of men in Red Sox shirts and a very drunk Swede showed up at the shack. Bradford muttered something about being a Yankees fan, but really it was more humiliating for me, because I am a Red Sox fan. Local fishermen stop by to sell to Floyd, and he grilled us fresh mackerel that was surprisingly mild-tasting, not dark and oily. Bradford said this was because the fishermen had scored the mackerel above the gills immediately after catching it. He has tried to get fishermen in the U.S. to do the same thing, but they are unwilling to take that extra step. To get to the northern coast we drove through the western interior of the island. These wild rugged mountains and rock outcroppings, known as Cockpit Country, are where many of the descendants of runaway slaves, called Maroons, still live. The Maroons learned the Arawak way of preserving meat by cooking it very slowly on the branches of allspice trees, known here as pimento trees, and rubbing allspice and other wild spices and herbs on the meat. The result is called jerk, a mispronunciation of a Spanish mispronunciation of the Arawak word. Looking for jerk was our prime objective along the northern coast. The northern coast is the most beautiful in Jamaica, with the clearest, gentlest water. But developers have built more and more large hotels, shops and other tourist installations, turning the stretch from Montego Bay to Ocho Rios into something resembling a very long mall. Then there’s Scotchies, a restaurant in a concrete building with a corrugated-tin roof. In a flash, Bradford was in the kitchen. “Excuse me. May I?” he said as he looked at the pork and chicken slowly cooking on allspice branches over a charcoal fire. Scotchies’ pork comes from local pigs raised to the restaurant’s specifications and is so succulent that, despite the ugly setting by the highway, I don’t know when I have ever had a better piece of pork. Almost two hours further east, past the tourist zone, the road gradually narrows to little more than a single lane of hairpin turns surrounded by steep walls of dense tropical growth. It is bad roads that save all the best parts of Jamaica. We were heading for Port Antonio, a town that the United Fruit Company built up early in the last century as a place from which to ship bananas. Kerry-Ann has deep roots in this part of Jamaica, where her father had a farm that’s still marked on most maps. Every hour, her Jamaican accent grew thicker and more lilting. From Port Antonio we took a quick boat ride to Boston Bay, where Maroons introduced the rest of the island to jerk. For many years, it was the only place in Jamaica to get jerk. Our destination, Boston Jerk Centre, has outdoor stands surrounded by ackee and breadfruit trees and is a lot more atmospheric than Scotchies. But Bradford was a little crushed. First, a small bus group showed up. Then the jerk pork wasn’t as good as it had been at Scotchies; it seemed a bit dry. “But the lobster’s good,” Bradford murmured. Kerry-Ann and I liked the light, crisp festival, though Bradford insisted May’s were better. On their return to the States, Bradford and Kerry-Ann set off to visit her family on Long Island, where Bradford resolved to get into the kitchen and start cooking. Kerry-Ann’s family, including her mischievous nonagenarian grandmother, who wore a broad-brimmed black hat that seemed permanently affixed to her head, reveled in the disagreement that unfolded as we discussed island food traditions. “Why is an avocado called a pear?” Kerry-Ann asked. Because it is shaped like a pear, her family answered. “But then why do Jamaicans call a pear an apple?” she countered. At least everyone agreed on one thing: The crisp festival that Bradford learned at Aunt May’s was the best. Mark Kurlansky is the author of 15 books, including Cod and Salt: A World History. His latest book is The Last Fish Tale.